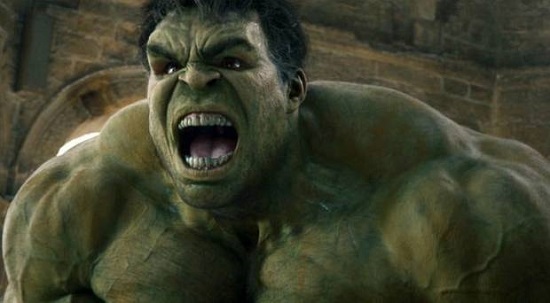 The Hulk, screaming. Image source. He spit out the bullet and crushed the gun easily. Then he raised his head and screamed louder than he had ever screamed before. He yelled, he roared, and the sound echoed through the night air. He pounded the ground with his giant green fists, flinging dirt everywhere. "Banner! Banner!" Hulk punched and smashed again and again. Hitting hard, shaking the ground. It hurt his hands but he didn't care. He was desperate. He was angry. He took off running as fast as he could, through the dark forest, roaring. "Banner, save Banner!" They wanted to kill Banner. And it made Hulk angry. Running, jumping, bounding among the trees, punching everything he came into contact with. And screaming, yelling, unintelligible, groans which words cannot express. He stopped at the top of a hill and roared again. "My Banner!" Angry. More angry. "Banner!" The sound carried over the hills and trees. Then Hulk was jumping and running again. "God hate Banner!" He screamed it. He grabbed a tree, pulled it out of the ground, and threw it. "Banner! Listen! God kill Banner!" He pulled up another tree. "Hulk hate God!" And another. And another. Hulk threw himself on the ground and kicked and pounded. "No!" He screamed and thrashed around more. "Hulk hate God." He pushed himself up to a kneeling position. Hot, angry tears ran down his face. "Hulk hate God." The Hulk screamed one last time and collapsed from exhaustion. A few hours later, Bruce woke up. With his clothing ripped to pieces. I'm alive, he thought. His whole body felt sore. What happened? he thought. God... He stopped. He didn't want to pray. It didn't feel right. Suddenly he felt like maybe he didn't want God to know all his thoughts. Maybe he didn't trust him. So he was alive, and that meant he was going to have to go back into the city, back to his normal life. He groaned, overwhelmed. He had thought he was done, that he had a way out, but of course the other guy ruined it. Slowly, he stood up and began walking. But maybe it wasn't so bad. He breathed in, felt the fresh air. He thought about his body getting oxygen. His body's needs, and the amazing biological processes that kept him alive and provided oxygen to his brain. That's a good thing, he thought. It was so simple, but he had never really thought about it. He looked at his hands, and they looked perfectly fine. Not a scratch on them, even though he knew that the other guy had been smashing and pounding everything last night. Hulk heals himself, thought Bruce. Hulk takes care of me. He thought about Hulk, and for the first time, he wasn't disgusted at himself. Maybe he liked Hulk a little bit. Was it because he had saved his life? Maybe. Or maybe there was more to it than that. WAIT. Bruce stopped himself. This is temptation. He was almost at the point of thinking sin wasn't that bad, and wow that was a dangerous place to be. But he was so tired of fighting it. Last night he thought he was done, that he wouldn't have to fight his flesh ever again. He didn't care if he went to heaven or hell- he just couldn't live like this anymore, so ashamed and so dirty. Hulk saved him. He wasn't going to fight Hulk anymore. And what about God? A bible verse came to Bruce's mind- "whoever is not with me is against me." Oh no, Bruce thought, it's terrible to think these things. I need to repent. After all that Jesus has done for me- dying for me, loving me even though I'm so sinful- how can I treat him like this? "You are not your own, you were bought at a price." Hulk hated God. Bruce had suspected it- of course his sinful nature is in rebellion against God- but last night Hulk had actually said those words out loud. And that was who Bruce was, deep inside. His sin nature literally hated the God who had done so much, shown him so much love and mercy he didn't deserve. No, Bruce couldn't stop fighting Hulk. But he was so exhausted. Really, last night he had decided he was done, and he wasn't willing to go back and take up the fight again. He thought of praying "Jesus, give me strength," but he didn't. Not now. Not yet. And he knew that it meant he was in rebellion against God. But he was just too exhausted. He arrived back at his home. He had thought he would never be back here. He took out his key- from under the mat because he thought he'd never use it again- and opened the door. It felt so weird to come back here. It was normal, it was home, but he had said goodbye last night and thought that was the end. Bruce collapsed on his bed. But he couldn't sleep, and he couldn't pray. He stared at his sandwich, which was untouched. He didn't feel like eating. And next to it, his bible. Also untouched. The other guy is too simple, too emotional, Bruce thought. He doesn't understand nuance. That's why he thinks God hates me. He doesn't understand... Bruce paused, trying to put it into words. ... He doesn't understand that God can love me and also think I'm a rotten sinner. Yes, of course God thinks I'm a rotten sinner, because it's true. And still, God loves me. Nuance, he said to himself. He thought about reaching for his bible, but he couldn't do it. Wow, this looks bad, he thought. First I entertain thoughts about not fighting my sinful nature, and now I'm not even going to read the bible today. Oh I really am a terrible person. He looked back at the sandwich, then tore off a corner and ate it. Trying to decide if he should repent and try to submit to God again. Then Bruce had a realization. A very bad, sinful realization. He stopped. Could he even dare to think these words? This was sinful, this was probably even blasphemy against the Holy Spirit. Ohh if he finished that thought, he was so going to hell. I can't fight anymore, Jesus, I'm sorry. I'm done. Bruce hunched forward, with his hands close to his chest, and said it in a barely-audible whisper: "The other guy loves me more than God." Yes, he was going to hell.